For the 19th year running, Azimut|Benetti Group, led by Paolo and Giovanna Vitelli, confirms its place in the highly-reputed Global Order Book ranking as the world’s top builder of mega yachts, with 97 projects totaling 3,536 meters in length under construction, far exceeding the other players. 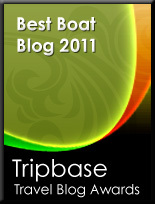 Behind this extraordinary result are the key assets on which the Group has built its history: the ongoing quest driven by ground-breaking technology to innovate and push boundaries, the ability to attract talented designers, a history of financial solidity and, not least, a broad-based distribution and assistance network with worldwide coverage. The Group ended the 2017/18 yachting season with value of production standing at €850 million (+18% on the previous year). The Global Order Book, the ranking drawn up each year by highly-reputed UK magazine Boat International, reports on industry trends for yachts over 80 feet long based on actual order data available and, once again in 2019, crowned Azimut|Benetti Group as the world's top builder of mega yachts, with a stunning 97 yachts over 24 meters long under construction (+26% vs 2018), or a total of 3,536 meters (+24,5% vs 2018). The key ingredient in yet another success in this long line was the ability to carry on innovating in terms of both technology and design. 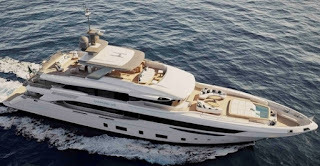 With its two brands, the Group has shown an extraordinary ability to work with clients to satisfy their demands for ever bigger yachts, as is demonstrated by the remarkable adventure of the three new Benetti giga yachts that will be launched and delivered to their owners in the coming months. Great financial solidity, which is essential when yachts this size are involved, and the dependability of the Vitelli family and Benetti’s management team proved once again to be winning assets. Paolo and Giovanna Vitelli, Group Chairman and Vice-Chairman respectively, commented: “This important result encourages us to carry on along our path. 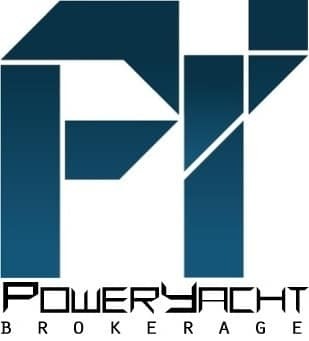 The only force that will never run out in our company is the desire always to exceed our limits.We are proud of our contribution to making Italy great in the international yachting industry!” The announcement made by the Global Order Book brings a year of important acknowledgements and awards to a close and represents the best possible start to the 2019 season, which will be marked by celebrations of the 50th anniversary of a Group that has left an indelible mark on the history of world yachting. Azimut|Benetti Group closed fiscal 2017/18 reporting value of production at €850 million (+18% on the previous year). The mission for the next 50 years is to continue to evolve, grow and stand out, and so to keep attracting, winning over, amazing and exciting people. On November 30, 2018 in Warsaw, Poland, Groupe Beneteau and Delphia Yachts Kot sp. j. reached financial closing of the acquisition by Groupe Beneteau of its operations designing, building and marketing sailing and motor yachts under the Delphia Yachts and Maxi Yachts brands. This acquisition was made through a dedicated Polish entity called Stocznia Jachtowa Delphia sp. z.o.o. in which the Group’s Polish subsidiary Ostroda Yachts sp. z.o.o. 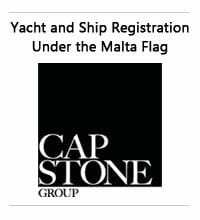 is holding 80% of the share capital, while Delphia Yachts Kot sp. j. retains 20% of such share capital. The acquisition agreement and its rationale was announced by Groupe Beneteau on July 12, 2018. The Sea Drive Concept, designed by the Peugeot Design Lab for Beneteau, received this award from the French Institute of Design during the ceremony held on 17 December at the Quai d’Orsay in Paris. The jury appreciated the ergonomics and streamlined look of this nautical dashboard, inspired by the Peugeot i-Cockpit, as well as its Ship Control connected technology developed by Beneteau. It also recognized the cooperation between automotive and nautical designers to create a concept that undoubtedly represents the future of nautical dashboards. It was a spectacle that left the City of Livorno and even the Benetti Shipyard itself open-mouthed. Everyone there was amazed, bewitched and most importantly proud as they admired a stirring and unquestionably unique parade they are unlikely to ever see again. The three magnificent yachts, while preparing to cross the Atlantic on their way to the USA, showed themselves off in all their imposing and timeless beauty: mega yachts“Spectre” (69 meters long), “Seasense” (67 meters) and “11.11” (63 meters) paraded together in the waters off the Livorno Shipyard, inviting everyone to look out to sea and reflect on the result of long, impassioned and meticulous teamwork. It is a result the Shipyard decided to share with its co-citizens, who were captivated by this amazing sight and proud to be able to contribute in some way to it. The three exclusive models, representing an example of style admired the world over, enchanted and amazed everyone who had made a special trip or happened to be there by chance, and who are sure to treasure the emotions aroused by the three mega yachts for many years to come. There were also a few tears of disbelief and emotion to be seen on the faces of several shipyard workers who had contributed to these projects, and seen the fruits of their labour take shape day by day. The three magnificent works of art are tailor-made to satisfy the desires and represent the passions of their demanding, perfectionist owners; as well as embodying the dreams of every sea and yacht lover. After months of careful preparation and consultation with the local Dutch council, work is now proceeding apace on a 166-metre second hall at our yard in Makkum. The expansion of the impressive complex in Makkum – known locally as "the cathedral", which can be seen for miles around – also includes new offices and workshops. The first phase of this project is due to be completed by November 2019. “This development involves a considerable investment,” says director Henk de Vries. “While the good Feadship order book is one reason for increasing capacity, as a family business we find it crucial to secure the future for generations to come. The community of Makkum has very close ties with this yard. 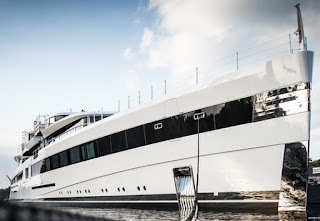 The people who work at Feadship are our most valuable asset and many others are connected because their neighbours or children work here or they support our business in some way.” The new hall will enable the Makkum team to work on two large yachts simultaneously. Continuity plays a role for the craftsmen: painters, pipefitters, plumbers, engineers... All the different disciplines work on a Feadship at different stages of construction and the second hall will make it easier and more efficient to gently transition from one project to the next. The new hall will include a 140-metre dry dock of 21.5-metres wide allowing for the construction of longer and beamier yachts. The new offices and workshops will be strategically situated between both halls, with two of the current buildings being preserved: It Strânhûs (an iconic 1970s office design) and the former wood shop, a characteristic brick building with blue sliding doors dating back to the early years of the yard which will be beautifully renovated. With a production value of over 650 million euros and the best returns among the leaders of the sector, Ferretti Group is about to close an extraordinary 2018 that cements its spot at the top of the nautical industry. This achievement is also established by the Global Order Book 2019, the reference ranking of the 20 largest manufacturers of yachts measuring over 24 meters, published by Boat International UK magazine. 91 projects completed (up 4.6% on the previous year) and 2,952 meters of yachts over 24 meters under construction (up 6.9%) are the numbers that ratify the strength of its growth strategy. Through constant investments in research and development, new models, and production capacity, the Group has done a complete renewal of its product range in recent years. Seven brands, six shipyards, and over 170 years of history: Ferretti Group is indeed the only player in the nautical market able to offer a complete range of boats, in terms of design and size, producing yachts of all sizes, from 8 to 95 meters, aimed at meeting the needs of every shipowner all over the world. "Italian nautical industry is doing well and Ferretti Group is doing great. The Global Order Book 2019 is a pleasant and gratifying reading: Italy once again stands out in the ranking for the production of yachts over 24 metres, and our Group grows at surprising and unstoppable speed. Excellence and innovation, supported by industrial and financial solidity, have driven the extraordinary results of 2018 in terms of profits and revenues" declared Alberto Galassi, CEO of Ferretti Group. "I would like to thank our shareholders, Weichai Group and the Ferrari family, who support the growth of our brands through the continuous reinvestment of profits, and our 1,500 employees, for their passion and commitment in building the most beautiful boats in the world". Formula offers a fantastic new line of Gear clothing and accessories, as well as an exciting array of other items for the boating enthusiasts. Formula’s wide selection will keep you and your crew boating in Formula style. Gulf Craft Chairman Mohammed bin Hussein Alshaali was invited as one of the guest speakers at the 12th edition Middle East Yachting Conference held last November 22 at the Yas Marina in Abu Dhabi. The conference was organized by the Dubai World Trade Centre with the theme of Accelerating Superyachts: Market Needs & Opportunities. It has brought together global business experts, government, tourism and maritime authorities to discuss new measures aimed at boosting the UAE as superyacht hub. The Chairman’s session was about "The regional and international growth of the superyacht market in the last decade". The session was moderated by Editor-in-Chief of The World of Yachts & Boats, Nabil Farhat. Both speakers gave their insights about the industry and brought to the attention of the attendees how both companies form the yacht world today regionally and internationally. Alshaali applauded the efforts the UAE government has put forward to ease the formalities for visiting yachts to be in the UAE. He also raised many more opportunities that the industry can benefit from and the government can implement. To date, 192 anglers and 51 Hatteras sportfishing teams have registered to compete for prize money and bragging rights in the inaugural Hatteras Cup tournament. They have entered more than 110 total fish so far in the Catch & Release (multiple species) and Game Fish Divisions, which include Heaviest Blue Marlin (non-world record), Tuna, Grouper, Wahoo, Snapper, and Dolphin. While fish weights are continuing to edge up (the Heaviest Blue division already stands at 615 lbs.! ), there is still time for anglers who do their fishing from the cockpit of a Hatteras to register and compete for $115,000 in prizes in this segment of the Hatteras Cup, which ends on January 31st, 2019. A cool $1 million also is on the line for the winner of the Heaviest IGFA-Verified World Record Atlantic Blue Marlin caught from a Hatteras Yachts sportfish. But if you have your eyes on that prize, you’d better get out there and wet a line, since that particular Hatteras Cup competition ends on Dec. 31, 2018! Jarrett Bay Boatworks is proud to announce their appointment as a finalist in the 2019 Boat International Design and Innovation Awards. The composite-intensive Jarrett Bay 90, Jaruco has been recognized as a finalist in the Game Changer category for her ultra-strong and lightweight titanium propeller shafts. The Game Changer is Boat International’s newest award category and provides an enhanced focus on innovation looking at ecological design and operation along with new materials, technology and processes. Jarrett Bay utilized titanium in several large applications during the 3-year build of the 90 foot sportfish yacht, Jaruco. Most notably though are her massive 30-foot propeller shafts, which save more than a thousand pounds over conventional stainless-steel shafts! Titanium was chosen for this build due to its low density and high strength, plus the benefit of being resistant to corrosion in salt water. Australian luxury motor yacht manufacturer Maritimo's game changing X series sport yacht models launched this year, along with new generation flybridge and sedan models, have combined to deliver record breaking sales in 2018. Overall sales are up more than 30 percent for the 2018/19 financial year on the previous year and in 2019 production is being stepped up to deliver vessels currently sold and to cater for further sales with exciting new models on the horizon. The headline grabbing X60 sport yacht launched at the Sanctuary Cove International Boat Show in May has been a runaway success and combined with its exciting new sibling, the X50, these two models have accounted for more than 20 sales since release. Maritimo lead designer, Tom Barry-Cotter, said the X series had added another layer to the Maritimo product line along with new customers seeking sport yachts with aggressive lines and styling yet capable of true long range blue water voyages. However, he said the new generation M series flybridge motor yachts still remained the core of the brand’s identity and sales success. "Our M series flybridge motor yachts still account for the majority of total sales," he said. "The experience of enclosed flybridge cruising is so unique to our brand, and our designs cater to such a diverse range of conditions and markets, it will remain the foundation of our DNA and what our brand is about." Fresh from the Fort Lauderdale International Boat Show early this month Barry-Cotter said interest in the Maritimo brand around the world had never been stronger. "Fort Lauderdale is a massive show and the world's most established and best known brands are displayed there, but we had a constant flow of people gravitating to the Maritimo display to view the X60 and see what the sport yacht world is talking about," he said. Barry-Cotter said the record year started with the Sanctuary Cove International Boat show and more than $40 million in sales. From there the Sydney International Boat Show saw the momentum continue and then across the Tasman the Auckland On Water Boat Show again saw a record number of sales. Sales continue to come in after the conclusion of a string of North American boat shows which will cap off the record year that was. He said the launch of the X series with its' innovative design made a strong statement to the industry internationally that Maritimo is committed to further establishing itself as a sector leader continually pushing the boundaries. "As new technology and ideas constantly flow into the entire our product lines, never resting in search for further performance and innovation we are raising the bar internationally in the luxury motor yacht sector." Maritimo's build pipeline now stretches out to 2020 and the company is in the process of expanding its state of the art Australian based production facility in keeping up with sales demand. Luxury motor yacht manufacturer Maritimo's international race team, Maritimo Racing, has had a year of highs and lows on the national and international race circuit in the 2018 race series and is well positioned to be a competitive force here and overseas in 2019. Maritimo Racing's Andrew Willaton and Steve Jellick rounded out the year with an outright win in the Upper Hawkesbury Power Boat Club's Bridge to Bridge event. Maritimo Racing ran in partnership with Team 3 Offshore powerboat racing using Maritimo engines, propellers and drivers. Andrew Willaton and Steve Jellick claimed the offshore class, and outright victory with a blistering time of 31m 29s - the fastest time in the last five years. Maritimo Racing hold the offshore class record at 30m 26s set in 2012 with Tom Barry-Cotter and Ross Willaton in the cockpit, but have yet to run a sub-30 minute time, or close in on the overall record of 29m 47s set in 2008. Barry-Cotter has stated they will announce 2019 Bridge to Bridge plans and whether Maritimo racing will campaign its own boat or partner again with Team 3 Offshore Powerboat Racing later in 2019. He said Maritimo has used the past year to ramp up the testing and fine tuning of its race boats for a major assault on the local and international series next year. Maritimo racing was involved in a high speed accident in the season opening race of the 2018 Union International Motonautique XCAT world championships in Fujairah, UAE in April which ended its 2018 campaign. And in the shortened Australian Offshore Superboat Championships the team encountered mechanical issues at the opening round of the season which impacted the team’s mathematical chances of retaining the national championship. "The opening rounds of both series we compete in saw 2018 championship aspirations crushed from the opening rounds, so our strategy shifted toward focus on development for 2019 during this year," said Tom Barry-Cotter. "We have used the season to concentrate on power, reliability and experimenting with setups. " Because we are always pushing to be at the front we sometimes have to take known/safe options in terms of setups, but this year because we had nothing to lose we tried lots of different setups to gather data that we wouldn't typically have tried in other years. “This will pay huge dividends for us in 2019. "Our new R36 is now performing even better than the well established 40 ft catamaran that we’ve campaigned since 2012 and it performs in all conditions and importantly is still being improved." Maritimo Racing are also in the middle of constructing a new R30 catamaran destined for the UIM XCAT World Championship in 2019. The R30 XCAT in construction has been designed by Maritimo and will be constructed using the latest advancements in carbon fibre technology. “There has been heavy design consideration of acceleration and handling to suit modern course designs and heavy analysis of the aerodynamic properties of the hull and deck. The latest cockpit safety design is currently undergoing panel deflection and failure testing in liaison with the UIM. The latest generation cockpit has increased head clearance and crash deflection protection engineered into the design and construction. Barry-Cotter said much of what Maritimo racing learned on the international and national race circuits eventually was incorporated into the company's range of production motor yachts. "We are the only production motor yacht manufacturer with a dedicated race team and that gives us a great advantage over the competition," he said. "The knowledge we gain through racing gives us a distinct advantage in terms of staying at the leading edge of production motor yacht manufacturing." South Australian game fishing enthusiast Roy Wells is use to being in some inhospitable sea conditions and he says his new Maritimo M64 cruising motoryacht is just the thing to handle whatever is thrown at it. Located in Port Lincoln, South Australia, Roy was on the Gold Coast this week for the hand over of his new pride and joy, the ultimate Christmas present, a $2.763 million M64 cruising motoryacht. "We are boating in the Southern Ocean and it is not at all unusual for us to be out fishing in three to five metre seas so I have to have a boat that is tough and that can handle the conditions," he said. Roy is a Maritimo convert having owned two other cruisers prior to taking delivery of his latest boat this week. He purchased an M52 in 2007 and kept that boat until 2011 when he purchased at M56. "The new M64 is in my opinion the best boat in the fleet as far as sea keeping ability is concerned," he said. "It is just the perfect balance of length, beam, motors and hull design and it delivers in a way that nothing else can. "The latest model is based on the beautiful old original 60 foot hull and I truly believe it is the best design of all the Maritimo's." Roy has powered his vessel with twin 1150 horsepower Scanias and after taking delivery this week and spending a few weeks on the Coast he plans to drive it home to Port Lincoln himself in a journey of approximately eight days. "I have been a Bill Barry-Cotter devotee for many years and I know from experience just how well boats he designs actually work in the ocean," he said. "This isn't a cheese and bikkies platform to bob about in Sydney Harbour it is a serious boat that can handle some seriously rough conditions." Roy said before he signed up for his new M64, named Stephanie after his daughter, he telephoned a number of M64 owners to ask them of their experiences. "Three of the four I spoke to were using their boats to travel around the islands so from Fiji, to New Caledonia, to Vanuatu, to New Guinea and New Zealand and that's a great testament to the quality of these vessels," he said. "There are not too many production cruisers that are doing those sorts of journeys." Maritimo's Australasian sales manager, Ormonde Britton, said Roy was one of the most active boaties amongst the entire group of Maritimo owners worldwide. "He truly uses his boat the way it is meant to be used and he is looking forward to many hours of fun in his new 64," said Britton. "A total of 12 M64's have now been sold and it is a very successful model." 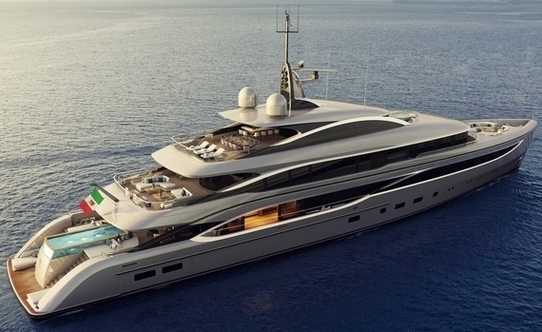 Monte Carlo Yachts has won yet another award for its achievements in the nautical sector. The “100 Italian Excellences” recognizes those individuals, companies and institutions that have distinguished themselves for initiative, ability, research, competence and innovation across all aspects of society, from medical and scientific disciplines to revolutionary startups and artisanal manufacturers. Monte Carlo Yachts will be featured in a namesake celebratory book by Italian publisher Riccardo dell’Anna. The fourth edition of the “100 Italian Excellences” award ceremony took place in the prestigious Sala della Lupa of Palazzo Montecitorio, which houses Parliament, in Rome. The Mangusta Gransport El Leon has just reached Barbados. After cruising off Viareggio in early December, the yacht smoothly covered over 4,800 nautical miles, setting an important record for the Shipyard - this is indeed the first Mangusta ever to cross the Atlantic Ocean. El Leon was delivered to her Owner last summer and was officially presented to the public and to the yachting industry during the recent Monaco Yacht Show, immediately meeting with great success. With her 54 meters in length, she is the largest yacht built so far by the Shipyard, as well as the first model in the new generation of Fast Displacement yachts, the Mangusta GranSport line, designed by Alberto Mancini. The Owner, enthusiastic about the yacht, which he had extensively tested during the summer, decided to turn his dream into reality: spending time on board with no compromises about performances and without having to take any time off his professional activity. And he decided to start at Christmastime, in the American seas. 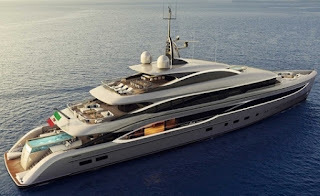 Usually, yachts of this size are loaded onto one of the many vessels that normally transport yachts between the two sides of the Atlantic Ocean, because their cruising range is not sufficient to make the crossing or for other reasons. But the Mangusta Gransport, unlike other yachts, is perfect to cross the Ocean by herself, because she was designed and built specifically to be fit for this kind of endeavors, too. “Land ahoy!!! Our voyage ends with these joyful words when we catch sight of the Barbados coast” says El Leon’s Captain, Paolo Bozzo Costa. “On 1st December we cruised off Viareggio with the aim of reaching the Caribbean on this new 54 m semi-displacement yacht built by Overmarine and willing to find out more about her peculiarities along the 4,800 miles that stretched between us and our destination. El Leon behaved outstandingly, confirming the seakeeping features of her hull, which I had already appreciated during our summer cruise. While cruising across the Atlantic Ocean, with well-formed swell waves further strengthened by the constant trade wind, the yacht impressed us with her great comfort, stability and performances. I kept an average speed of approximately 14 knots – something very few boats can achieve and reached the Caribbean with enough fuel in our tanks to relaxedly enjoy our first Caribbean cruise. Tecnorib will be amongst the protagonists of the first show of 2019, which is also one of Europe’s main boat shows: the Dϋsseldorf Boot will be the setting for the presentation of the new partnership with an important international dealer, Best Boats NL. Arie Drenth, the manager of the company, which has six offices in the Benelux area, has commented: “We are very proud to represent such a prestigious brand in this region that has always been attracted to the Made in Italy allure”. Pirelli Speedboats and Tenders, the only Italian products to be distributed by Best Boats NL, will be sold mainly in Holland(where there are four Best Boats NL offices) Belgium, and Germany. “This partnership and our participation in the Boot are a great way for our company to start the year off”, added Gianni De Bonis, Tecnorib’s managing director, who went on to say: “The Dϋsseldorf show is the ideal setting for the first exhibition of our whole Jet Tender line, with models ranging from 2.9 to 4.5 meters in length”. Among the main yachts and superyachts builders in the world, Sanlorenzo presents, in collaboration with Lerici town, the exhibition “Navigators. A voyage through the Sanlorenzo shipyards” which will take place from December 20th, 2018 to March 10th, 2019 at the San Giorgio’s Castle. Conceived as a real-life immersion in the production process of the shipyards, the installation presents more than 30 black and white snapshots by photographer Silvano Pupella who, through his lens, gives us a narration of that perfect union of artisanship and technology that has made Sanlorenzo the peak of excellence in the nautical world over its 60 years history. An evocative photographic reportage produced in the La Spezia shipyard, that reveals how each model of the Sanlorenzo Superyacht is the product of a complex multidisciplinary and innovative process: each boat, over 40 meters in length, takes shape beginning with its hull forged in metal, like a piece of art, through the work of capable local craftsmen who tend to every small detail, making each creation unique and personalizing it to achieve the effect desired by the ship owner. The project, conceived by Massimo Perotti, CEO and Chairman of the company, once again demonstrates Sanlorenzo’s ability to expand its imagination and to be open to new creative languages, offering unknown perspectives on the yachting world and of Made in Italy. For 59 years, Sea Ray has set the standard and pushed the limits of performance and craftsmanship to elevate the boating experience. 2019 will mark the 60th anniversary of Sea Ray at the helm of defining the boating lifestyle. Sea Ray and its dealer partners enter a new decade of innovation, with great momentum fueled by a strong fall season. Fall boat shows highlighted new technology and a range of successful new models and product launches. For example: The continued success of outboard models, larger dayboats, and recently released new models such as the SLX 400 Outboard and Sundancer 320 Outboard drove increased sales for the company. Sea Ray Connect, powered by Nautic-On, a new technology which debuted at the Fort Lauderdale International Boat Show, effortlessly conveys a boat’s location and status of vital systems to users via a smartphone app. The Cannes Yachting Festival and Interboot Expo in Germany featured the introduction of the Sun Sport 230 Outboard. “We could not have asked for a better boat show season to affirm dealer and consumer confidence in Sea Ray,” said Brad Anderson, Sea Ray president and general manager. Sea Ray attributes its lasting popularity and evolution of industry-leading product to the achievements of its dedicated team. “We have a bold vision for the future, which touches all facets of our operations and a relentless dedication to be the best - all supported by investment in technology, capacity and people. As a leader in this organization, I can’t tell you how excited I am heading into our 60th year knowing the bright future ahead of us, and that is grounded by our strong heritage and the confidence I have in our organization,” said Anderson. Sea Ray has also continued investments in its Tellico operations in Tennessee, which just celebrated its 35th anniversary in September. “At Tellico’s 35th anniversary, it was a personal honor to recognize our dedicated team, including 18 individuals that have served the facility since it began in 1983. The Sykes Creek manufacturing team in Merritt Island, Fla. has increased production of the flagship SLX 400 Outboard to ensure that Sea Ray is able to better meet consumer demand. Our teams at both Tellico and Sykes Creek ensure that our commitment to meticulous craftsmanship is carried out in every Sea Ray,” said Anderson. Anderson also credits Sea Ray’s dealers for the company’s continued success and strong momentum. “We’re looking forward to joining our award-winning dealer network at the Marine Dealer Conference and Expo (MDCE) in Orlando and celebrating with those earning Top 100 recognition at this annual event. We look forward to carrying this celebration into 2019 with continued recognition of our dealer network that has helped to build this incredible brand for 60 years.” Sea Ray’s wave of innovation is expected to continue in 2019 with the roll out of a renewed focus that will drive everything the company does. “At Sea Ray, we believe that richer moments experienced on the water lead to a richer life. That’s why everything we do is designed to make each moment exceptional. As our company continues to evolve, the pride and passion of our brand shines through from bold, distinctive designs to industry-leading technology, and to a commitment to quality, craftsmanship and service that will lead us into an even more exciting next 60 years,” said Anderson. Unsurpassed service, incomparable business operations, and unwavering professionalism are just three of the many qualifications Sea Ray dealers, the most awarded dealer network in the country, must achieve to be named a Top 100 Dealer by Boating Industry. Sea Ray is honored to announce that 14 dealers were recognized in the prestigious lineup with Austin, Texas based Sail and Ski Center taking the top spot. These Sea Ray dealers were selected from thousands of dealers in North America. Dealers are judged on business operations, professionalism, marketing tactics, customer service and more. MarineMax and Prince William Marine Sales were also acknowledged as Boating Industry Top 100 Hall of Fame members in attendance at the event. “For 60 years, Sea Ray dealers have been serving loyal and repeat customers,” said Brad Anderson, president and general manager, Sea Ray Sport Boats and Sport Cruisers. 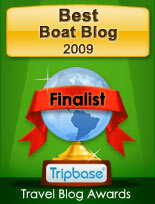 “Sea Ray is the most awarded brand with the most awarded dealer network in the country. Our dealers are the face of Sea Ray in the marketplace. We congratulate these elite dealers for this well-deserved recognition.” Honored with the coveted #1 Top Dealer title was Austin, Texas based Sail and Ski Center, who is mourning the recent loss of legendary Co-Founder, industry pioneer and true Sea Ray partner, Rod Malone. “I’m personally grateful to have had the opportunity to work with him and learn from him,” Anderson said. “He was instrumental in growing Austin and San Antonio as top Sea Ray markets, and we can’t forget the Sail and Ski partnership with one of Sea Ray’s most famed events, Aquapalooza, hosted on Lake Travis.” Anderson said that after a 31-year relationship with Sea Ray, Malone is dearly missed, and his legacy lives on with a dedicated team of individuals he inspired within the Sail & Ski organization. Spring Brook and Sima Marine are industry veterans and are experts in the 30’ – 80’ yachting segment in the Great Lakes. Spring Brook was founded in 1961 and is currently owned and operated by Kyle Stenzel, Sima Marine, owned and operated by John Sima, also have over 50 years of experience in the region with a proven record of offering incredible yachts, paired with excellent service. “Sirena Yachts has a vision of where the boating market is going and created a line that not only stands out on the dock, but will also stand out against any competitor producing “Navetta” style yachts on the market today. Their quality of construction, materials and components used, and the methodology behind their build process is second to none. We could not be more excited to offer these vessels to our client base in the Eastern Great Lakes” said Kyle Stenzel, President of Spring Brook Marine. “Sirena Yachts will be a great fit for what we do in the Lake Erie, Lake Huron, and Lake Ontario. The space each model offers its owners is not equivalent to anything else on the market today. The fit and finish details, level of customization, and Sirena’s dedication to building each yacht to the highest standard is very impressive. The 58 will be a great fit for the avid cruiser in the Great Lakes or Loopers looking for the best performing Navetta style cruiser on the market today” said John Sima, President of Sima Marine. “It is with great pleasure and excitement that we welcome Spring Brook and Sima Marine to the Sirena family” said Mr Ali Onger, Sirena Marine Marketing and Communication Manager, “After already having sold numerous yachts in the US we are now launching our next market penetration phase, which entails the appointment of world-class dealers. With great infrastructure, a dynamic team, a loyal customer base and excellent after-sales support, Spring Brook and Sima meet and exceed the high bar we’ve established for aspiring Sirena dealers” added Mr Ali Onger. Angler Rob Crane was fishing his Viking Too Easy II on the northern tip of Fraser Island, Australia, when he struck gold. Using 130-pound tackle and a handcrafted lure, he landed a black marlin that tipped the scales at 1,431 pounds. Rob said, "This is a once in a lifetime catch." The fish was donated for research. This is the second biggest black marlin caught in Australia. Peter B. Wright holds the Australian record for landing a 1,442-pound fish in 1973. True luxury, far from mere exagerations, means having ones desire satisfied, no matter how small, and owning something unique and different from all the others, something that answers the most personal needs. This is the philosophy that underpins Benetti new Bnow, the family of displacement yachts with a steel hull and an aluminium superstructure in the Custom product line. Featuring streamlined modern exterior lines and a vertical bow, the yachts in this product family offer well-being and comfort accompanied by much shorter delivery times. With the help of Benetti’s advanced construction technology, all Bnow models will be built in less than the standard time recognized by the super yacht industry. Four different lengths will be on offer: 50 meters, 55 meters, 63 meters and 68 meters in length. The result of close collaboration between Benetti and UK-based superyacht designers RWD, the yachts will have a layout that can be customized and newly designed exterior contours aligned with specific demands from various owners. In response to the original brief “to create an innovative well-being concept for the maximum comfort, light and use of spaces.” RWD have developed a seamless indoor-outdoor living area with panoramic Pool Lounge as an extension of the aft deck and Beach Club. The creativity brought to bear by RWD has produced four models that share a unique family feeling and are immediately recognizable, with their sleek, sweeping lines. Their profile stands out for the dynamic union it creates between the decks, which have long windows that act as connecting elements in the creation of a uniquely harmonious whole and represent the main distinctive feature. All the layouts feature a new and revolutionary concept of on-board lifestyle, because they make innovative use of the spaces from day to night. As can be seen above by the rendering of the Bnow 63, this last type of yacht too reflects developments in the yachting market and the needs of a precise type of owner, one looking for a casual and contemporary feel without compromising on the highest levels of comfort and privacy. Privilege from France presents the new Euphorie 5, an optimised power catamaran for superb performance and remarkable comfort. The Privilege Euphorie 5 is powered by two Yanmar 220hp diesel engines for long range and short handed cruising. Its large owners cabin is situated on the front center of the boat and features full standing height for maximized comfort. The Privilege Euphorie 5 will have three flybridge, and three lower deck options. The choices for the customer are various from a flybridge with or without second helm station, and lower deck options for more private three double cabins or charter friendly four double cabins layout. For the 2018 fall season Colombo presented an improved 36 Bellagio which now is also offered with new stern drive propulsion option, coming from twin Volvo 260 or 300hp engines. The new stern drive option will be added to the IPS pod propulsion choice. The 36 Bellagio has been a successful model launched in 2011 and presented from the since 2007 Sarnico Group ownership, who took over the highly respected 1956 founded Colombo boat builder in 2007. Designed by Nuvolari Lenard the Colombo 36 Bellagio is an evolution of the classic and sporty Italian sport cruiser with sleek lines, and a unique reverse opening bathing platform. Inside the 36 Bellagio offers a twin berth in a double or twin single berth layout, with a shower head to starboard, and a galley and relaxing sofa to port side. Viking is proud to announce the addition of the new 38 Billfish, an evolution of the highly successful 37 Billfish and another example of the New Jersey mission to build a better boat every day. The 38 Billfish was designed and built with the same DNA as its predecessor, as owner/operator vessel, it offer simplicity and ease of maintenance, serving as ready-to-go fishing machines as well as versatile cruising boats with reliable inboard diesel power. Like her convertible brethren, the 38 Billfish’s flybridge is designed with a tournament-style center console walk-around helm. Two helm chairs are optional. The 38 Billfish’s command deck holds a salon-like living area that includes a port-side U-shaped dinette and a fiberglass hi-lo table. The cockpit at ten square meters is the largest in its class, with mezzanine seating. Below, there’s a large forward stateroom available with either a single queen bed or optional crossover bunks and two hanging lockers; an L-shaped galley; and a head with enclosed shower. 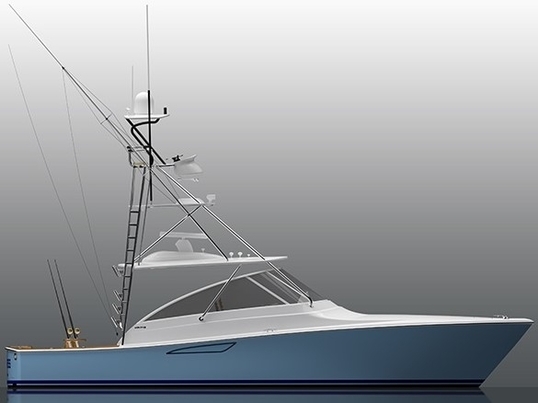 The Viking 38 Billfish will be powered by twin Cummins 550hp with line shaft propulsion, and a fuel capacity of 1741 liters. Engine are the same as the 37 so speed should be more or less similar, while fuel capacity in the new 38 has increased by just over seventy liters. The 38 Billfish will make her debut at the Viking VIP private show in Riviera Beach, Florida, February 1st, followed with a World debut at the Miami boat show. Founded in 2002, the Italian Piacenza Absolute has been one of the recent success stories, building a strong international recognized brand in a matter of few years thanks to the very global looks of the models on offer. This is the sixth series website for Absolute, aiming to show what the company is about, and that it was a matter of success, but one of careful planning and experienced passionate people. 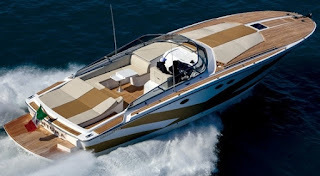 While today Absolute is sixteen years old, it is worth noting that the founders and owners have been building boats for a couple of decades, as the President and main shareholder is none the less then Angelo Gobbi, who had a brand with his name which he founded in 1962 i.e Gobbi. The people who founded and manage Absolute do come from the Gobbi experience. Absolute first models where the 45 and 25 both launched in 2003, with the 41 following in the fall of 2004. Today Absolute offers four lines; Navetta, Flybridge, Sport Yachts, and Sport Line which total fourteen models on offer from eleven to 22 meters in size. The current entry level is the 40 STL, and the flagship is the 73 Navetta, and its newest being the just launched for 2018 48 Navetta. For 2019 Absolute will expand with three new models; 62 Fly, 47 Fly, and 68 Navetta. The new Absolute website is available in English and Italian language and takes you around with the following buttons; Absolute, Yachts, News, and Events. Absolute has also its social media hubs with a link at the bottom of the page taking you to its; Facebook, Youtube, Linkedin, Pinterest, and Instagram pages. CRN is pleased to announce a new milestone with the sale of a fresh, fully custom seventy meter steel and aluminium yacht, hull number 139. The new project has been developed by the CRN technical office working closely with Italian architecture and design studio Vallicelli. Architects Andrea Vallicelli and Alessandro Nazareth created the concept, the external lines, and the interior layout with passion. The super yacht, equipped with both functional and design features, effectively achieves a sophisticated overall balance while offering generous indoor and outdoor spaces for the owner’s family to enjoy. The superstructure’s succinct style is emphasized by the flowing lines that lend the design an original, elegant aesthetic. CRN is currently constructing three pleasure vessels at its Ancona hub: the 79-metre 135 and 62-metre 137, slated for delivery in 2019, plus the 62-metre 138. For 2018 Fiart present the new 47, a model which in reality is an update of the Four Seven. 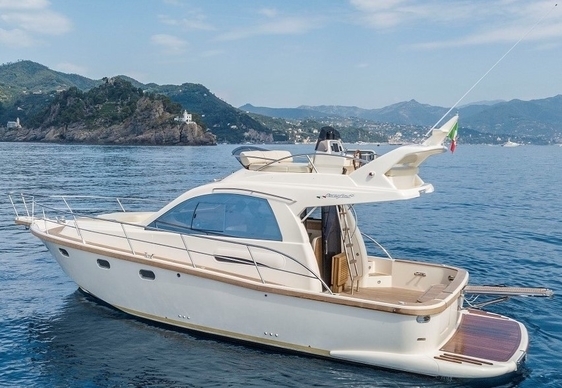 When the Fiart Four Seven was launched in 2008 the Italian Neapolitan boat builder presented a model which reinterpreted the classic inspired style to clients requests adding a hard top and a more aggressive line with a sweeping shear line. The new Fiart 47 builds on these but for 2018 and beyond adds a new hard top design, now higher and more protected, and new hull side windows serving the lower deck accommodation area. For the remaining the new Fiart 47 builds on the strong qualities of the Four Seven from surely the largest aft deck in the category, to its traditional yet very comfortable three double cabins lower deck layout. The Fiart 47 is still powered by twin Volvo 435hp with IPS pod drives which allow top speed up to 35 knots. Austin Parker presents the project for the AP 60 Sportfly a reinterpretation of the brand style, coming again from the hands of renowned Italian designer Fulvio de Simoni. The AP 60 Sportfly concentrates a lot of its innovation in the spacious aft deck, which will feature a central sun-pad, and C-shaped dinette. The AP 60 looks to be based on the AP54 with ten centimeters of extra beam, and the added length used to add outside space in the aft cockpit deck. But do not be mistaken a lot of thought has gone into the interior as well with three double en-suited cabins serving six guests, including a full beam owners midships owner stateroom. A four double cabins version is also available, with the fourth twin bunk cabin in replacement of the galley to port side with this moving to the main deck. The Austin Parker AP 60 Sportfly is to be powered by twin Volvo 725hp engines with IPS pod propulsion with estimated top speeds up to 31 knots. During the Cannes boat show 2018, Cranchi debuted its new E26 Classic model. A new entry level from Cranchi the E26 Classic is a design from Christian Grande who here presents a minimal looking day hopper cruiser with double V-berth accommodation cabin forward. The Cranchi E26 Rider will eighter be powered by single diesel Volvo 300hp or gas petrol of 280hp with a stern drive propulsion. Following recent trends the E26 is also offered in the Rider version, with open bow replacing the cabin and outboard power. The project of the all new Vanquish VQ58 series is being built for an owner who wishes to blend keynote elements from three of our driver’s boats. The starboard side garage arrangement of the VQ50 is combined with the successful features of the best-selling VQ54 in a hardtop version and the cool styling elements of the new VQ65 to create a stunning sport yacht that is sure to be an instant hit with Vanquish fans. At the heart of the VQ58 concept is a flexible sport yacht that combines the best when it comes to speed, comfort and layout. The VQ58 can be offered in three different interior layouts; two large en-suite forward and midships cabins, dinette forward with two guest cabins at midships, or central tender garage and a dinette with forward double berth open plan layout. There is also three layout for the main deck, with changes concentrated in the central part around the dinette and exterior galley wet-bar area. In developing the hardtop for the VQ58, Vanquish designed it in a way that would be equally suited for an open-top or T-top model in the future. The Vanquish VQ58 Hardtop can be powered by standard Cummins 600hp with ZF Zeus pop propulsion, Volvo 725hp with IPS pod drives, and Man 1200hp with surface drives. Speeds are estimated to go up to fifty knots with the large engine option. Cayman presents its new World wide web virtual showroom. 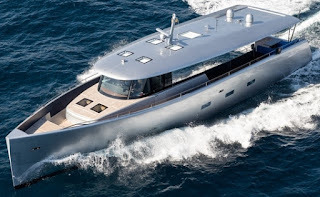 Cayman Yachts was founded in 1990, first within the Mochi brand, with a 30 foot model, delivered in seventy examples in ten years of production. In 1996 company founder Luigi Prosperi went on his own, opening a yard in La Spezia, the Cantieri Navali del Tirreno and launching the 38 Walk Around model, which was the start of good things to come. In 2016 Cayman was bought from Flag Marine and restarted production in 2017 with build to order models. The philosophy of Cayman has been in the past for a fresh approach to exterior design, first with the particular deep walk around side decks and joint characteristic of an Italian Mediterranean style with those of an American Sport Fishing solutions. Today Cayman has abandoned these design solutions with its new models particular those presented from the new ownership looking typical Italian modern designs. Cayman currently offers five models in its range, starting from the 2017 launched S450, and going up to the new 2018 launched F920 flagship, while its latest project is that for an open type 450 Spider sport cruiser. The new Cayman Yachts website takes you around with the following buttons; Yachts, Facebook, and Contact. Cayman is also on the following social media platforms; Facebook, Twitter, Youtube, Twitter, Instagram, and Linkedin. Heesen announce the 80 meter Project Cosmos, a project which will feature exterior lines by Winch Design, and interiors appointed by the owners to Sinot Exclusive Yacht Design. This is the third collaboration between Heesen and the award-winning Dutch studio Sinot. Previously, Sinot worked on the design of first in the 55m Fast Displacement Steel class, and the 70m FDHF multi-award-winning Galactica Super Nova, Heesen’s largest yacht launched to date. At 80.07 meters, 1700 Gross Tons and with a top speed of 29 knots, Project Cosmos will be the world’s largest and fastest full-aluminium motor yacht with conventional propeller propulsion system. The interior design for this exciting project is inspired by elements from nature. Natural mathematics, such as the Fibonacci sequence, form the basis for the interior architecture. Together with clear graphic lines the result is a clean architectural environment. Special, featured materials, such as back-lit onyx, straw marquetry and crystal glass panels are framed within the architectural lines to emphasize the beauty of these materials. Custom design furniture elements constructed from glass, marble, metal, and various types of wood add the finishing touches to the interior decor. 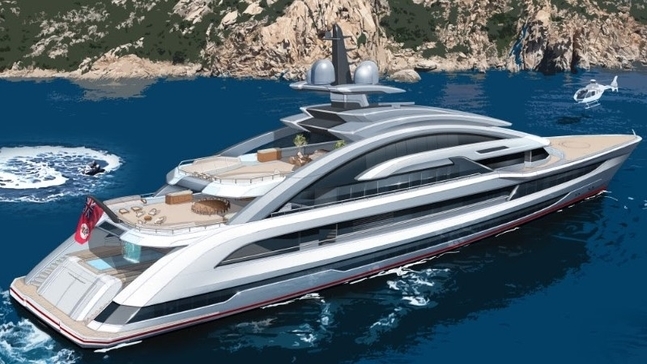 Project Cosmos, with exterior lines penned by Winch Design, is due for delivery in April 2022. For 2018 Portofino Marine present the new 38 Fly an evolution of the popular and long standing since 2004 produced 37 Fly. Considering the long production of the 37, the update is well deserved, and with these super structure design changes, the new 38 Fly takes nothing away from the traditional looking flybridge motor cruiser. 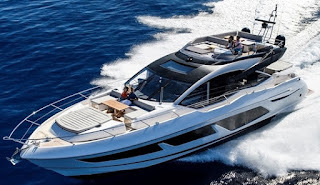 The new Portofino 38 Fly design changes actually add more to a fine mix of tradition and modernity, and I sincerely hope that the updates follow in the other Portofino models. As all Portofino models the new 38 Fly still sticks to its roots with the solid wooden toe rail, and safe three inch deep bulwarks adding a feel not only of uniqueness and quality but that of a solid looking motor cruiser. 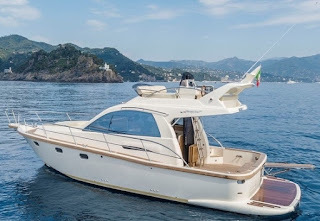 The Portofino 38 Fly interior as usual is presented full of wood finish, and offers a layout of a two cabins lower deck; owners cabin forward and guest twin to starboard, and a saloon and galley main deck. 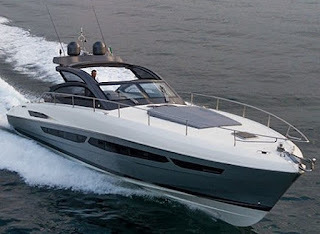 The Portofino 38 Fly is powered by four engines choices two from Volvo, Yanmar and FPT from 330hp up to 400hp. Canelli is looking to expand its range and after launching the different looking Revolutio 39 Cocktail in the fall of 2017 presents the project for the Innovatio 40. Designed by Maurizio Marzocca the Innovatio 40 while based on the same hull lines of the lightly smaller 39 sister and offering a similar center console package, comes out as different due to the various options available for its exterior and interior. Eight different solutions are offered for the Innovatio 40; two for the fore-deck, four for the cockpit aft deck, and two for the interior. The Canelli Innovatio 40 can be powered by five available engine options; two petrol gas engines of 300 and 350hp, and three diesel engines from 300hp to 435hp. Propulsion choice is in stern drives and or IPS pod drives. Baltic launch the M78 a fuly custom 23 meter semi-planing explorer yacht designed by German Mani Frers and conceived for offshore cruising, combining stunning interior and exterior styling with highly sophisticated hull design which should provide her owners with a comfortable ride at sea and a luxurious living platform at rest. Mani Frers naval architecture, in the Baltic M78 makes the interesting observation that the speed achieved by large sailing yachts now matches those of motor yachts, much can be learned from the two disciplines to produce highly efficient hull forms. Frers has also studied recent commercial ship research, which aims to make vessels as efficient as possible. This has led to the motion of the M78 less aggressive, which in turn has the unexpected effect of reducing motion sickness. M78 stability is further enhanced by two Seakeeper gyro stabilizers, all this, linked with the light, stiff hull and deck shell result in an outstanding yacht. Baltic M78 narrow beam is fundamental to the yacht’s easily driven and sea-kindly hull. She’s powered by twin Volvo diesels 625hp driving through IPS dual propeller pod drives for further efficiency. A lot has been worked into her accommodation including a stern garage for a tender and a well-equipped galley featuring a dumb waiter leading to the deck saloon. The yacht features striking photographic studies and specialist stucco paneling putting it in a class of her own. Key features on M78 deck include a remarkable reflective glass deck superstructure housing the wheelhouse and deck saloon, deep bulwarks providing great protection and an all-round walkway and custom stainless steel work including unique 3D printed stainless steel push-pit and pulpit design which enhances the yacht’s contemporary look. M78 is an advanced explorer yacht which will set the standard for further projects in this field from Baltic Yachts. Gamfisherman new management is starting to expand the company and now the Stuart, Florida custom sportfish boat builder is looking at many new options. 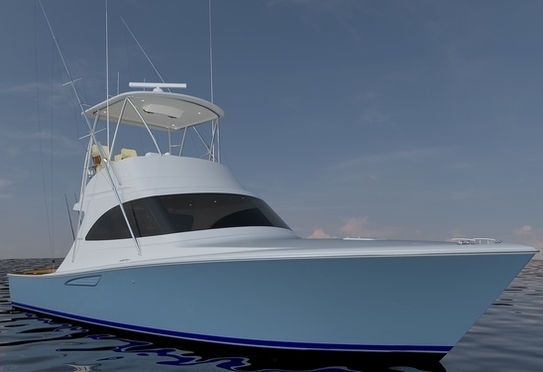 The Gamefisherman 50 Express project expands on what made the Florida boat builder famous, building traditional inspired sportfish express models. The Gamefisherman 50 Express features a two cabin two head interior with dinette and galley in between the cabins. Power for the 50 Express will come from twin 1000hp up to 1200hp engine choices. Tornado present the new 50S model, a sport yacht of classic features and looks reinvented by Francesco Guida and Pierluigi Mimmochi. The Tornado 50S is a tribute to deep Vee fast open cruisers and yachts which inspired the 1980's and nineties, and is in itself a restyling of the 50 launched in 2010, and features differences to the windscreen design, bigger engines of twin Volvo 600hp from 435hp, and improvements of both the external and interior layouts. The hull one of the 50S featured a two cabin two head traditional cabin layout; forward main cabin, guest cabin at midship, guest head to starboard, dinette and galley in between the cabins, and a single berth crew cabin with private head to starboard. The Tornado 50S new 600hp engines choice deliver power up to 40 knots of maximum speed, while a cruise of 25 knots gives a range of 430 nautical miles and a 4.8 miles per liter fuel consumption. Construction - resin infused Epoxy Vinilester resin, hull bottom in solid fiberglass with Airex core sides. Superstructure in mixed core and solid glass elements. Benetti present the Diamond 145 project, a 44-meter displacement super yacht that draws on the core features of the Displacement Class line history. Expert owners will be struck by a yacht that can be an integral part of their finest moments with unparalleled style, comfort and safety. The elegant design suggests the proportions and details that convey a feeling of sturdiness and power. The discreet but tangible sense of refinement will strike a chord with owners who love to combine glamour with credible practicality. The seamless design of the huge glazed surfaces accentuates the length of the yacht and its brightly-lit interiors. The exterior styling, which stands out for its remarkable continuity of lines and surfaces, is the work of Giorgio M. Cassetta. The interior design by Achille Salvagni is based on roomy, welcoming settings, where the choice of light color shades underscores the wealth of natural light. Access to the main deck is by two wide stairways in the stern, which are also one of the yacht’s architectural highlights. The main cockpit welcomes guests in a wide and bright setting, and leads seamlessly to the immense, fully glazed main lounge. The full-beam master cabin in the bow has a roomy wardrobe, a full-beam bathroom and a study or office. The galley and service areas are laid out to make best use of the space available, in such a way as to provide high level service on board, without encroaching on guests’ privacy. The upper deck features a big outdoor area in the stern with access to the lounge, which is dominated by extensive glazed surfaces that cover 80% of the perimeter. The extremely spacious piloting area is positioned next to the captain’s cabin for perfect visibility. The bow area covers seventy square meters and features a remarkable custom spa pool. The sun deck, over 115 square meters of outdoor space and can be furnished according to the owner’s tastes. All life rafts and all functional features are hidden or integrated in the design to avoid contaminating the purity of the yacht’s contours. The night area for guests is on the lower deck and is made up of four double cabins, with the option of a fifth on the upper deck. The crew quarters and laundry are fit in the bow area. The beach area and beach club can be fully customised and can be enjoyed both at sea and at anchor. The two 1400hp Man engines will drive the Benetti Diamond 145 to a top speed of 15 knots and at a cruise of eleven knots the super yacht will have a range of 3,800 nautical miles. Founded in 1968 Bugari from Ancona has been pretty much quiet in recent years. For those that don't know Bugari had build quite a name for itself in the 1980's and nineties for building one off custom super yachts most of them in alloy. But things seem to be getting interesting again for Bugari with ownership and management changes in 2014 presenting a new three model line up of semi-custom motor and super yachts from 77 to 100 feet designed by Filippo Salvetti, who looks to be the new Italian designer to watch of 2018 and beyond. Bugari has started this new line up with the launch of the new F86, a two deck and half semi wide body super yacht with a modern profile, and an owners stateroom on the main deck. The lower deck of the F86 will be offered in three options of three or four guest cabins. A crew lobby with two cabins sleeping four is located at midships in between the engine room and the guest cabin area. The Bugari F86 competes with the the likes of the Azimut Grande 27 Metri for a sub 28 meter semi wide body super yacht with owners stateroom on the main cabin, and three or four cabins on the lower deck. The Bugari F86 is powered by twin Man 1900hp engines which will allow speeds up to thirty knots. 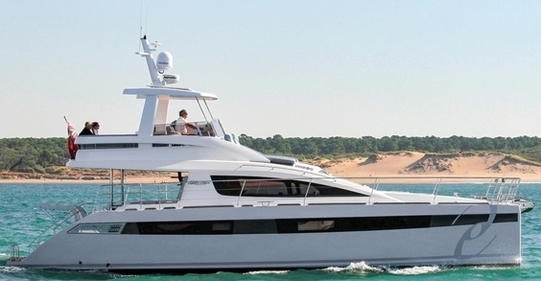 The Viking Yacht Company is proud to announce the addition of the 38 Open. 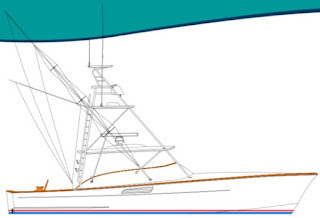 The 38 Open will share platform with the upcoming 38 Billfish, both of which are models based on the outgoing 37 Billfish. The 38 Open presents itself as an owner operator sportfish cruiser and Viking's entry level model, offering simplicity and ease of maintenance, serving as ready-to-go fishing machine equipped for inshore and offshore missions as well as a versatile cruising boat with reliable inboard diesel power. 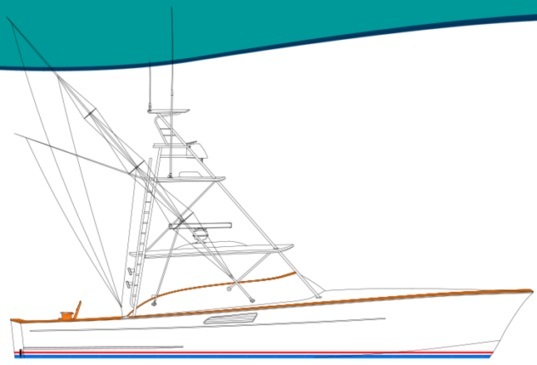 The 38 Open and Billfish apart sharing same hull, cockpit, and have a similar mechanical arrangement but differ in command deck and bridge configurations. The ten square meters cockpit is equipped with a laminated mounting plate in the deck for fighting chair, rocket launcher or table installations. Other features include in-deck insulated fish boxes port and starboard, a walk-through transom door and lift gate, a bait freezer with upper tray, a transom fish box and live well, rod holders, tackle storage and fresh and raw-water wash downs. Both boats feature two-person seats flanking the center-line walk-through. There’s refrigerated drink storage, as well as ample general storage throughout. The 38 Open’s command deck also has ample seating, with port and starboard L-shaped lounges and storage below. A raised centerline command station gives the driver excellent sight lines and is equipped with a fiberglass helm pod, power-assist hydraulic steering with stainless steel wheel and Palm Beach style controls. 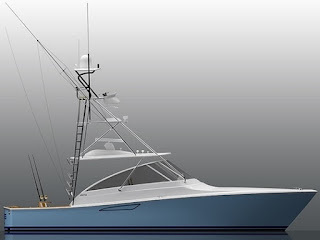 Viking’s Palm Beach Towers can outfit the 38 Open with a custom tuna tower with a second helm and a buggy top. The 38 Open has a cabin layout geared more toward day boating, featuring a starboard-side sofa with storage. The galley and head with enclosed shower are positioned on the port side. The galley features Corian counter-tops, two-burner electric stoves, microwave/convection ovens, cabinet storage and under-counter drawer-style refrigeration with built-in ice makers. The forward cabin has a lower double bunk and an upper single with a starboard-side hanging locker. As construction goes Viking 38 series will be build with a modified vinylester resin used in the entire hull skin. End-grain balsa and closed-cell foam are used as coring materials in selected areas for optimized strength and stiffness while minimizing weight. The single integral fiberglass fuel tank, sealed to the hull with resin foam, is resin infused with balsa coring on all sides for stiffness. The hull-to-deck joint is mechanically fastened every three inches and fiber-glassed inside. The Viking 38 Open will be powered with twin Cummins 550hp. The Viking 38 Open will launch in January 2019, with a World wide preview at the February Miami boat show. Feadship has on 22 October 2018 launched the 93 meter Project #814. Representing one of the largest yachts ever built by Feadship, this 93-metre masterpiece was towed from construction hall of the Kaag yard. Further commissioning work will continue in the months ahead including the addition of balconies and wing stations. The yacht will remain covered over the winter, to be seen in all her splendid glory next spring. With a generous beam of over fourteen meters, this groundbreaking Feadship will set a new standard in luxury. Working in hand with the experienced owners, Michael Leach Design has drawn an elegant and timeless exterior with breathtaking lines. Reymond Langton’s stunning interior is akin to a beautiful and contemporary jewelry box. Five years in the making, the owners with the help of Burgess assembled a world class build team. Scouring the globe for the finest and rarest materials Project #814 promises to redefine the boundaries of luxury yacht construction. One of a kind features include a two-deck IMAX theatre, a fully certified helipad with Jet A fuel, four VIP suites each with 8k TVs, and facilities that cater to a wide range of sports including golf, basketball, volleyball and soccer among many others.